Genie are giving away 6 free Genie Invader 3” Aluminized 4WD Exhaust Systems to 4WD owners – ONE EACH WEEK – until the end of July. LIKE this post & COMMENT to get one entry in the current weeks draw. SHARE this post & COMMENT to get an entry in each remaining weekly draw (up to 6 entries in total). Important: Make sure you put your 4WD model and POSTCODE in your COMMENT. The Genie Invader performance exhausts are Australian built in our high quality jigs and come with a catalytic converter (where applicable) and free shipping is included of course. Genie exhausts are the easiest to DIY install. You’ll get power and fuel gains on your 4WD. There are 6 weekly draws. The winner is drawn randomly from all valid entries for that week. The draw dates are: 27/6/14, 4/7/14, 11/7/14, 18/7/14, 25/7/14 and 1/8/14. Entries for each draw close at noon the same date as the draw. The winners will be posted on the Genie social website page and a PM will be sent to the winners. The instructions above and on the Facebook page form part of these terms and conditions. Genie reserve the right to determine whether an entry is valid. PRIZES: Prizes include shipping to Australian addresses only. Prizes are not redeemable for cash. 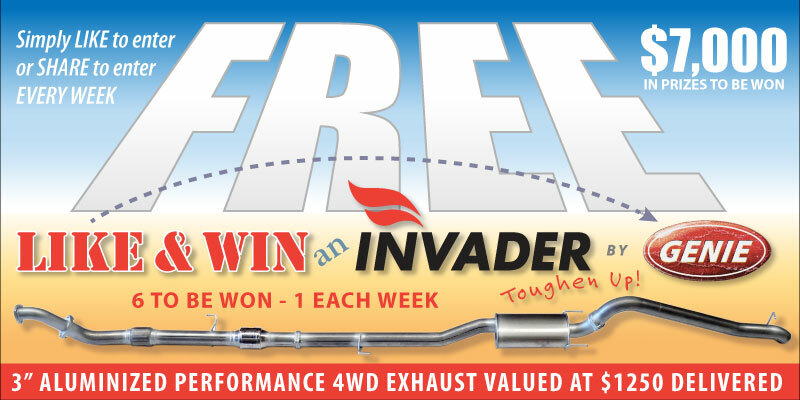 Winners must select their prize from the existing range of Genie Invader exhaust systems to match their 4WD vehicle. Please refer to the range of Genie exhaust systems on the Genie website. The prizes are a DIY product and, as such, any installation costs or associated costs are the responsibility of the winner. Entrants must be Australian residents and must own a 4×4 vehicle. Entry in this promotion is deemed acceptance of these terms and conditions. Winners agree their name and photo may be used for publicity purposes. Genie reserve the right to adjust the period of the sweepstake or shut it down early. This promotion is in no way sponsored, endorsed or administered by, or associated with, the social website host. Any questions, comments or complaints regarding the promotion will be directed to Genie Performance Exhausts, not the social website host. Indemnification and limitation of liability by entering the sweepstakes. Each entrant agrees to indemnify, release and hold harmless Genie Performance Exhausts, the social website platform, administrator, advertising and promotional agencies and all their respective officers, directors, employees, representatives and agents from any liability, damages, losses or injury resulting whole or in part, directly or indirectly, from that entrant’s participation in the sweepstakes and the acceptance, use or misuse of any prize that may be won.